So many people rave about their holidays on this amazing Indonesian island – but you’re still scratching your head. What’s all the hype about? Variety is the spice of life and if you're a self-confessed foodie, Bali is the answer. Not only is Indonesian food incredibly tasty, vibrant and full of flavour, it's also cheap as chips. 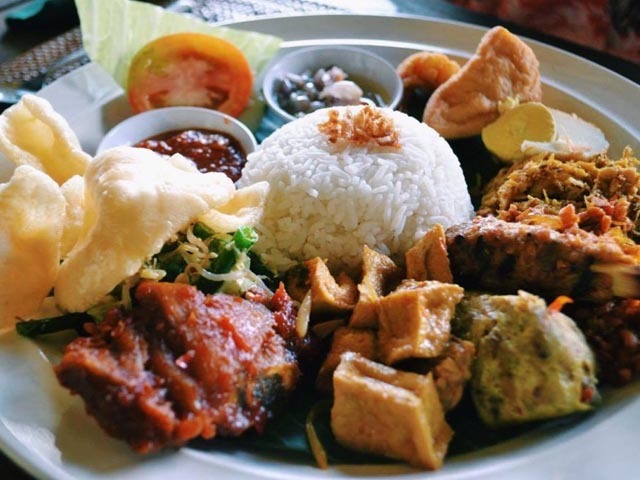 Eat like a local at a Warung (local diner) on the beach with a fresh coconut or fine-dine in Seminyak – whatever calls. If you're a Bali beginner try beef rendang, nasi goreng, nasi campur, chicken satay and Gado Gado. Good to know: Say no to ice-cubes and try to only drink bottled water. The Balinese culture is influenced greatly by its history and the arrival of merchant vessels from China, India and the Dutch. It's infamous for its rich arts culture, showcased through various forms of dance & costumes. Hinduism is also the major influence behind the temples & festivities that may come with it. Good to know: Respect the culture & religion. Invest in a sarong for temples and try to check out the traditional 'Kecak' (Monkey) dance at sunset in Uluwatu. It's super impressive with more than 50 men performing in chorus-like rhythm. Amongst the natural beauty, beaches and amazing food, the nightlife in Bali and beyond is world-class. Think cold Bintangs on the beach for sunset, live music, or DJ's performing on rooftop clubs. Potato head beach club in Seminyak boasts one of the best sunset views in town along with Single Fin in Uluwatu. Good to know: Don't lurk the streets at night on your own. There have also been a few incidents in the past of drink spiking leading to serious health issues. Be mindful of the drinks you order from bars and clubs. Whether you're into surfing, health and fitness, yoga or general badass adventuring, Bali's it. 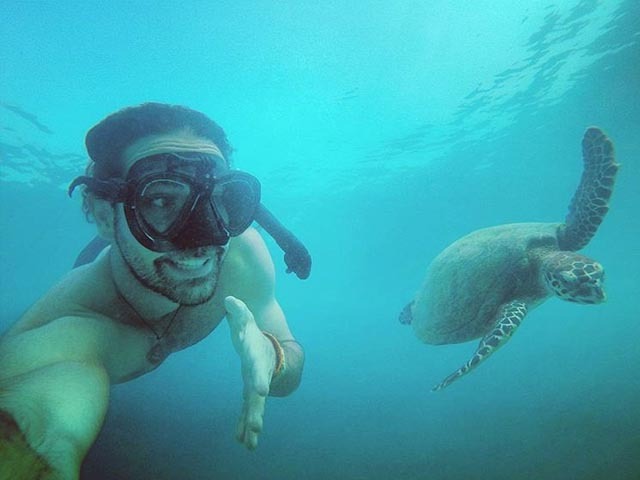 Go scuba diving off the Gili islands with sea turtles, snorkel through coral gardens in Gili Meno from traditional glass boats or catch a surf break with some pro locals down at Kuta Lombok. And if all of that STILL doesn't satisfy your adventure cravings, you can hike up the summit of Mount Batur and see volcanoes. 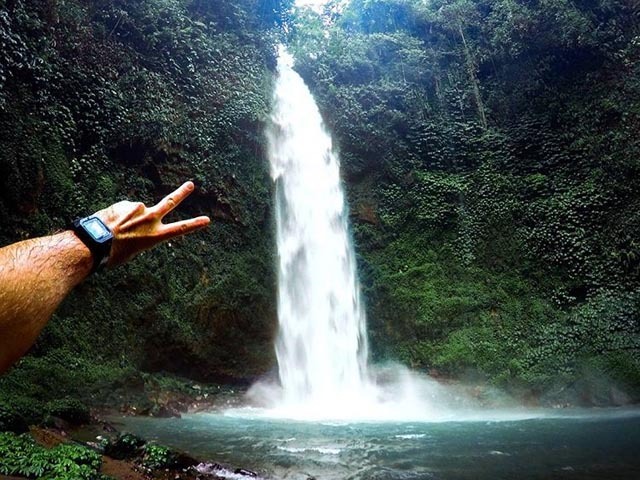 Good to know: There are a few waterfalls located around Bali. Our pick? The Tegenungan Waterfall, located 30 minutes from Denpasar. Take it from a seasoned Bali traveller, this country is truly paradise. 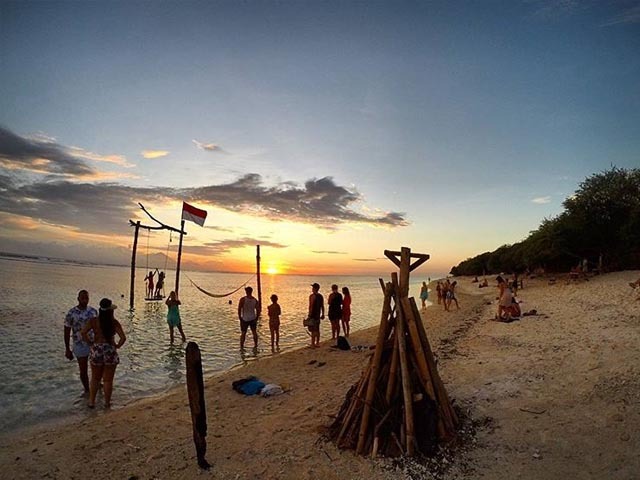 Embrace the island vibes and head to the Gili islands, where there are 3 tiny islands – Gili Trawangan, Gili Meno and Gili Air. Good to know: The swing below is located on Gili Trawangan and the perfect spot for sunset (and an epic shot for the Gram). Indonesia is filled with plenty of locally made handicrafts, wood carvings, and Balinese artwork that can be purchased throughout the country. We're not sure why, but hilariously and quite truthfully, the 'oddly shaped' souvenirs below (OK, OK, the penises) are notoriously available everywhere. Good to know: For the best (and cheapest) souvenir shop in town, head to Krisna on Sunset road in Kuta, Bali. Here you can find everything from food, clothing (Batik), sarongs, candles, moisturisers, incense, and most definitely lots of wooden willies. MEET THE LOCALS The Balinese community are a friendly bunch. Learn a few catch phrases, like 'Apa Kabar' (How are you) and "Selamat Pagi" (Good Morning). The bits and bobs of the local language will completely enhance your experience. Good to know: Try to barter like a local. The truth is, most travellers will get an overly inflated price (especially at the markets). The standard rule is that you usually go 1/3 and work your way from there. Fifty shades of green best describe the tropical surroundings of these islands. Lush waterfalls, mountainous jungle ranges, soaring volcanoes, evergreen rice paddies, fresh water streams, Monkey temples, hidden cliff face beaches, infinity pools – the list goes on. 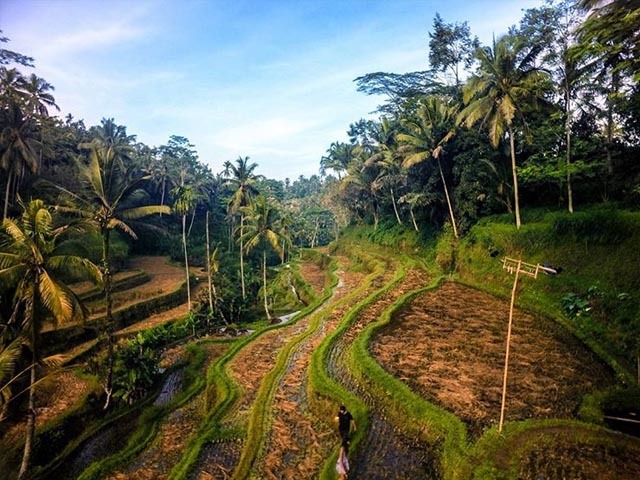 Good to know: Travel to Ubud to see the Balinese rice paddies. Here you can check out the Monkey forest and later head to the infamous Bebek Bengil (who's speciality is crispy duck) which overlooks the Balinese rice fields. You don't visit Bali without dabbling in some world-class diving & snorkelling. Whether you want to pick up a new skill or test your level of endurance – this is the place to do it. LEARN TO SURF Ever dreamt of picking up a new skill? 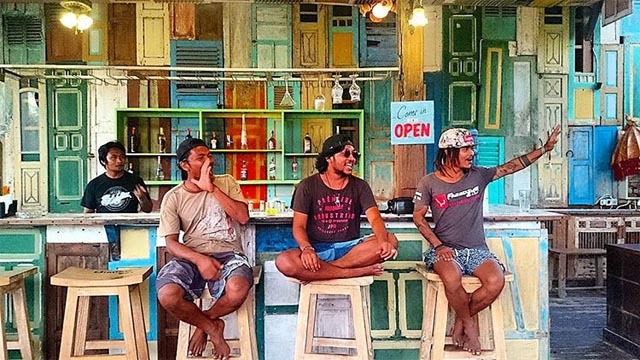 In Bali and beyond you can learn a trick or two with the locals. 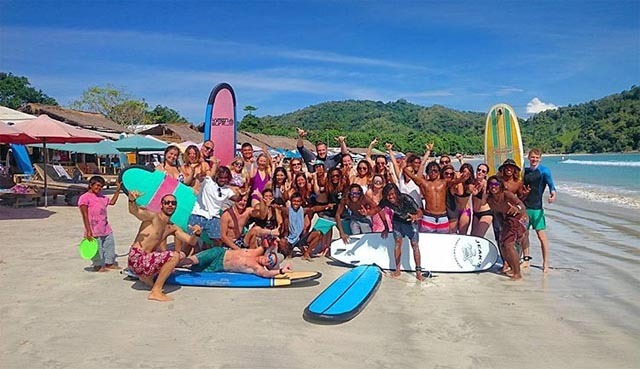 Good to know: Head down to Kuta Lombok (Bali's neighbouring island), an untouched surfer's paradise where there are almost no crowds & herds of water buffalo nearby.